On 31 October 2008, a person or group with the moniker Satoshi Nakamoto published the Bitcoin whitepaper. The whitepaper laid forth the vision of creating a decentralized peer-to-peer cryptocurrency that could serve as a medium of exchange and store of value trustlessly. Satoshi Nakamoto first started discussing Bitcoin with fans and enthusiasts on Sourceforge forum, which then became a forum on Bitcoin.org. In time, it was set up as a separate forum — Bitcointalk — and the 1M post milestone was hit on July 22, 2012, close to 4 years later. The genesis of Bitcoin, the community rallying around it, and all related content being posted, created the potential of commercialization of cryptocurrencies and related projects. Without the ideas swirling through the community, either praising or hating on various ideas or projects, the entire cryptocurrency industry would not have been possible. In the early days, interesting side projects being created would inevitably be posted on Bitcointalk to “advertise” to the community and receive feedback on its potential and viability. You can take a trip down memory lane, with this compilation of the all-time top threads: The most iconic bitcointalk threads. History on Bitcointalk. We can see that on January 15, 2010, the first ever exchange was announced and shared with the community: [EXCHANGE] First bitcoin exchange announced by bitcointalk user dwdollar. We could see this as the start of the commercialization of the cryptocurrency space, as more users sought to create and launch products that made it easier for others to transact and use cryptocurrencies. As a result, there became a stronger imperative to better reach and acquire new customers — and one of those ways was, of course, advertising. While already deeply familiar to most of us, let’s define what advertising means:“Advertising is the nonpersonal communication of information usually paid for and usually persuasive in nature about products, services or ideas by identified sponsors through the various media.” (Bovee, 1992, p. 7). Indeed, in the old days of crypto, it started as a user on a forum sharing their ideas and products. Bitcointalk introduced the sale of ad space beneath the first post of every topic page in April 2012. Here’s a visualization based on the impressions for a 7 day period at yearly intervals. As users navigate through the forum, they see ads from potential advertisers of products on Bitcointalk (see image below). 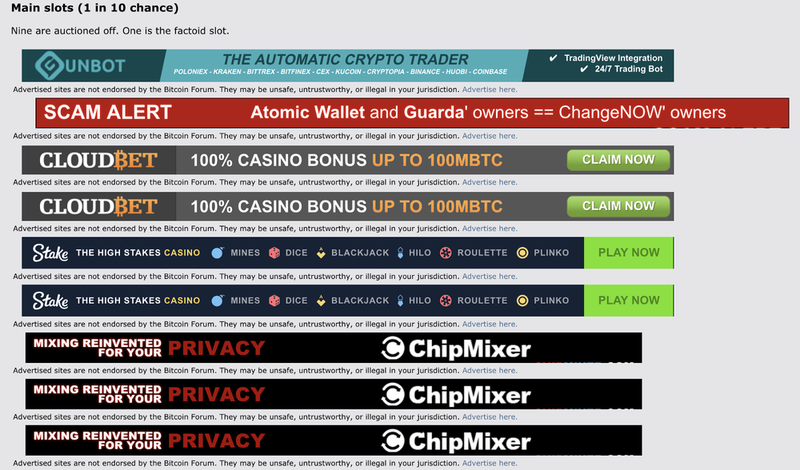 The ads that won the auction for the space, for the past 7–10 days, are a mix of casino apps, privacy mixers, public service announcements and crypto trading bot product. This form of advertising is also known as display advertising. Advertisers are charged either on the number of impressions or the duration of the campaign as stipulated in the Insertion Order (IO) — basically, an order that the advertiser makes for their ads to be inserted. The cost of advertising is typically manually decided by the publishers, based on the supply and demand of a specific ad slot. If publishers see good demand on its web properties, they may continue to raise the price to maximize earnings, to a point that is still acceptable to the advertisers. Conversely, if the publishers have excess inventory, they may drop the price for some ad slots which are less popular, such that they don’t have to resort to serving house ads (advertising that the publishers, or the “house”, place in order to fill the slot) and leaving those slots not monetized. Back to 2017: The “Initial Coin Offering” (ICO) craze started to gain momentum, attracting the attention of developers, token funds, retail investors, regulators and everyone in between. This new fundraising phenomenon enabled a new class of startups built upon the principles of community-building and crowd-sourced investments, introducing new dynamics in how the crypto world approached customer acquisition. From working with key opinion leaders, airdrops to online advertising, the toolbox of customer acquisition in the crypto world began to change again. In the past 1.5 years, the single most significant development that drove interest in cryptocurrencies globally was the “initial coin offering” for utility tokens. Startups and projects raised over $19B from January 2017 to June 2018 (https://www.newsbtc.com/2018/06/29/icos-have-generated-13-7-billion-in-2018-so-far-nearly-doubling-2017-numbers/). The number is astounding, considering that two-thirds of the amount was raised in the first half of 2018. From Google search trends, we can spot strong correlations between ICO and Bitcoin search terms. This suggests the surge in interest in bitcoin and other related cryptocurrencies was driven largely by the activity and fervor around initial coin offerings.Despite efforts by certain countries such as China to restrict ICO activity with an outright ban on September 4, 2017, the activity from China simply migrated overseas, to the benefit of many other countries. Successful token sales such as EOS, TON by Telegram, Kyber Network, Zilliqa, ICON etc have all taken place over the past 1.5 years. Facebook / Google / Twitter / programmatic advertising (Facebook, Google and Twitter banned crypto advertising for some time, relaxing rules for regulated exchanges, educational content in Q3 2018). Small number of advertisers are running on Programmatic platforms, all creatives are subjected to advertising exchanges’ approval. From our analysis of the top tactics, we find that digital advertising channels have been very effective for reaching a large audience at scale. Of course, digital advertising for crypto companies has not been smooth sailing for the most part. Facebook, Twitter and Google banned crypto / initial coin offering related ads in Q2 2018, and Programmatic is also treading in a grey areas subject to creative approvals by publishers or networks. The most popular sites for cryptocurrencies, such as CoinMarketCap withover 50M monthly impressions and ranked in the top 200 sites globally in Q2 2018, provide advertisers with significant reach to cryptocurrency enthusiasts directly. For many token sale projects, there is significant information symmetry in the market. As a result, many participants rely on social proof, such as funds or famous crypto influencers also investing in the project, as a signal for the popularity or viability of its prospects. Much like how reviews of restaurants on Yelp and reviews of apps on the App Store affect downloads, having top funds and prominent community members review their projects favorably goes a long way in helping projects achieve “high signal rating”. While these may seem free, much of these costs may also be hidden in the form of exchange listing fees (https://www.financemagnates.com/cryptocurrency/news/pay-for-play-why-exchanges-token-listing-fees-are-bad-for-the-industry/) or advisory fees, with some projects going to the extent of actively market-making tokens when listed on exchanges to keep up appearances. Founders of token projects will probably also find many emails in their inbox from event organizers pitching event sponsorship packages. While event marketing is great for building connections, they are the least scalable and most costly option, with sponsorship packages at some events going at the rate of $100,000 and up. “Blockchain weeks” are springing up everywhere, including in Korea, San Francisco and Singapore recently, and are great gathering places for funds to exchange information, and for projects to form partnerships with one another; but they definitely are not cost-effective in terms of acquiring users for any product at scale. That said, there is generally less experience with advertising offerings and measurement among projects, since some founders hailed from a more technical background, or relied more heavily on social proof as their marketing go-to. While advertising clearly delivers scale — once you’ve figured out your product and pipeline, adding more advertising dollars will give you consistent results — such scale was not always understood or needed while these projects were still figuring out their product-market fit or fundraising mix. As a result, many of the advertising veterans in crypto coming from proven business models, such as blockchain-based gambling apps or casinos accepting crypto. This might have resulted in misunderstanding or close association of advertising in crypto to what some may consider unsavory. Of course, the rise of ICOs also spawned another, much more insidious, group of advertisers. As there was a great deal of retail interest in cryptocurrencies, opportunists recognized the opportunity to make a quick buck, creating fake projects to scam investors. Where do these scammers reach out to retail investors? You guessed it, online advertising via platforms such as Facebook, Google,Twitter and Programmatic. Naturally, as these scams became more commonplace, the platforms slowly began their war on crypto advertising to protect consumers. This had great repercussions on how marketers — even those from legit projects — could acquire new customers for their crypto product. With the explosion of ICOs and its related marketing, many of the major platforms such as Facebook, Google and Twitter stepped in to ensure that consumers are protected from fraudulent ads as a safety measure, while internal policies began to be drafted. Display banners — Where do I turn to? The traditional platforms like Facebook and Google offer advertisers a self-serve platform to target Crypto Audiences (users with verified interest in cryptocurrencies and blockchain) using targeting options provided by their platforms based on the data they have on users’ profiles. On Facebook, advertisers can target users using interest targeting in crypto-related topics. Google Search enables advertisers to target based on search terms used by their users, for example “Best ICOs”. Advertisers on Twitter can target followers and lookalikes of certain exchanges, for example “@Binance”. Whitelisting of advertisement accounts as well as creatives are uncertain and difficult, even today. Given the relative uncertainty of the traditional platforms, advertisers should also consider other channels for advertisements. Sites such as CoinMarketCap provide a great avenue for the same amount of reach. Advertising methods are largely banners on the various pages; Native features are also available, such as buttons for recommended wallets and exchanges, for different cryptocurrencies. Programmatic advertising offers another avenue with which to run on crypto websites. This can be done by curating a site list. In Programmatic, “auctions” are conducted to determine the fair price for a particular ad impression, happening in milliseconds before it hits the user’s screen. This creates an economy of demand vs supply, ensuring that valuable inventory is available to advertisers while generating a good yield for the publisher. Another appeal of Programmatic is that it offers unique crypto audiences supplied by third party data providers such as Oracle; through partnership between agencies and publishers, advertisers could have access to second-party data comprising users who browse crypto-related contents. Where advertisers are worried about creative approvals, they can also circumvent the approval process by striking a deal with publishers to set up a Private MarketPlace (PMP) to run ads. Using a PMP comes with the benefits of layering on valuable crypto audiences, otherwise not possible by doing a direct IO buy. At Crypto Audiences, our partnership CoinMarketCap will allow crypto advertisers to engage with CoinMarketCap audiences wherever they are, on the websites and apps that matter to them — Facebook, Youtube, content websites & gaming apps, and more. When we trade cryptocurrencies, it’s fair to say that we never really know where the markets is going. The great thing about advertising is that, while cryptocurrencies and blockchain industry is definitely unique with its own set of principles and rules, it follows similar trends as compared to other industries when it comes to advertising. Since 2010, the Display LUMAscape is a living document that is updated based on where the display advertising industry is moving towards. There’s definitely been a consolidation in the industry with many players getting acquired. The companies that are able to survive have been able to offer significant performance as compared to others. Facebook, Twitter, Google stands out due to their reach. The big agencies have deep client relationships and are able to adapt accordingly. Players in the middle that are uniquely differentiated on product have been able to continue competing in the market. The cost of advertising for many cryptocurrency-related products are measured in CPMs (cost per thousand impressions). Even though advertisers usually pay for impressions, they might be more interested in other metrics such as clicks and conversions. While impressions served certainly has great value — awareness, branding, top of mind recall, share of mind — they can be difficult to quantify when it comes to actual contribution to bottom line. Only when we are able to measure clicks, completed views and conversions, can we systematically optimize to get better results. In cryptocurrency advertising, as it stands now, CPM buying is still the most common practice, since a lot of the media buy is still being done through direct IO. This does not mean that the publishers don’t offer a CPC (cost per click) measurement, or the advertisers do not track CPA. It simply means, like it or not, that charging by CPM is the most straightforward way for publishers to monetize, while not being held responsible for other metrics. With the limited options for crypto companies to advertise, they still have to compromise with accepting CPM buying for now. Some cryptocurrency-related advertising agencies are emerging to challenge the status quo. We will see a shift towards optimizing and quoting for campaigns in CPC (cost per click), CPA (cost per action/acquisition, such as signing up as users), CPCV (cost per completed views) terms. Even though these metrics have existed for almost as long as since the advent of digital advertising, they are now not commonly used in crypto space due to the lack of experience in advertising measurement, let alone in creating pixels or codes for tracking and optimization. Case in point, moving towards measurement via CPA will require advertisers (exchanges, mining companies, crypto projects) to place a tracking pixel on their site in order to attribute the user “actions” (landing on a page, signing up for offers, taking an action etc) for that specific campaign. This will also allow for retargeting and creative sequencing, achieving desired objectives for advertisers. These will require the rare agencies who have specialists in both crypto and advertising fields, with the knowledge to set up the campaign for success for crypto product types. Part of this includes the ability to increase the chances of getting approval to run campaigns in FB, Google, Youtube, Programmatic; to setting up tracking and remarketing; and to meeting the objectives of key deliverables. A few of the truly unique agencies also have partnership with top crypto publishers to offer ultra-targeted audiences to turbo-charge the campaign. One of the key bets that the larger platforms bet on in 2014 was video advertising. Youtube offered pre-roll videos that play before your favorite cooking class video on Youtube started. In fact, some of these pre-roll videos that last 6 seconds are so good, you will not know if you prefer the actual video or the ad itself (https://blog.hubspot.com/marketing/best-six-second-pre-roll-ads-on-youtube). Facebook offered native videos that autoplay as you scroll through your feeds on Facebook and Instagram, without sound. Twitter offered video advertisements that also could appear right before licensed and timely content like Superbowl touchdown instant replays. Programmatic also opens up myriad of videos inventories, such as (mobile) vertical videos, native videos, and outstream video. As cryptocurrencies and blockchain shoot for greater mainstream adoption, we ought to see more efforts to create better consumer-facing videos, in line with standards in other industries. Videos as a tool can be very effective in invoking emotions in users, tell stories that are difficult to convey with a static image. Promotion of videos created can also momentarily capture the attention of users so they can make an informed decision quickly. It is safe to say that all advertisers want to serve ads to the targeted user with the widest reach and at scale. While this sounds like a simple goal, it is not that easy when it comes to implementing it. Data is scarce, and options for where to run ads are limited. Knowing this, at CryptoAudiences.com, we recently partnered with the leading website in cryptocurrency and blockchain, CoinMarketCap, to offer advertisers the ability to reach users from the website. Especially since we understand the challenges and opportunities in both crypto and advertising, we see how combining Facebook, Google, and Programmatic advertising will reach over 2 billion users who exhibit verified, real interest in crypto through their browsing or purchase behavior globally. Expertise in creating the right campaign strategies will be important to meet the KPIs of crypto advertisers running exchanges, crypto hardware companies, dApps (decentralized apps), brands and other projects in the space. It’s really important to note that the cryptocurrencies and blockchain industry is still in a nascent phase. In the past 10 years, we went from the release of the Bitcoin whitepaper to an entire industry of over $200B in market capitalization of circulating cryptocurrencies and tokens. It will be truly amazing to see where we will be in 2028. As a form of payment, store of value, method for financing, unit of account — these are all use cases we’ve explored in the past 10 years, and will continue to do so in the next decade. I’m betting that there will be very large transaction volumes and we’re just getting started in building the infrastructure to support these volume and the products built upon the technology. CryptoAudiences is a crypto advertising agency focused on achieving advertising objectives for the top companies in the industry. With over 20 years of advertising experience, we drive results for your campaigns. Our team and advisors hail from established advertising and blockchain technology companies such as Twitter, The Trade Desk, #Chain, Cobo and CoinMarketCap. CryptoAudiences is a preferred partner and official reseller of CoinMarketCap. Target audiences with a verified interest in cryptocurrencies through programmatic, Facebook, Youtube advertising channels, wherever they are on the web. Your campaigns will reach 10M+ of the highest quality crypto audiences in the world today.